Now that's cool. Interesting that the steering wheel is gone because it's not needed, but the column is still there because the gas and spark levers are needed. Kinda dangerous by today's standards. If he needs to stop suddenly or hits something he's probably not gonna like how things turn out. That T appears near as new ! Great photo ! I bet it's a lot easier getting in and out of when the steering wheel is gone though. The wheels looks REALLY cool. Those would look good with a demountable rim. Easiest way to keep the throttle & spark handy? dangerous as heck if they left the shaft stub there though. Was it removable in this early model? If I had a choice I think I'd choose hitting the gear case cover over the shaft. I was thinking the same thing Seth. I don't think there is a steering column. All I see is the two levers. I wanted to the steering wheel on, just to give the driver something to hang onto. I was out-voted! Those wheels look like Kalamazoo wheels. Hard to find nowadays. The 23 is on Fairmont wheels. I'm looking at the underside. The unsprung weight of that thing must have been ENORMOUS. 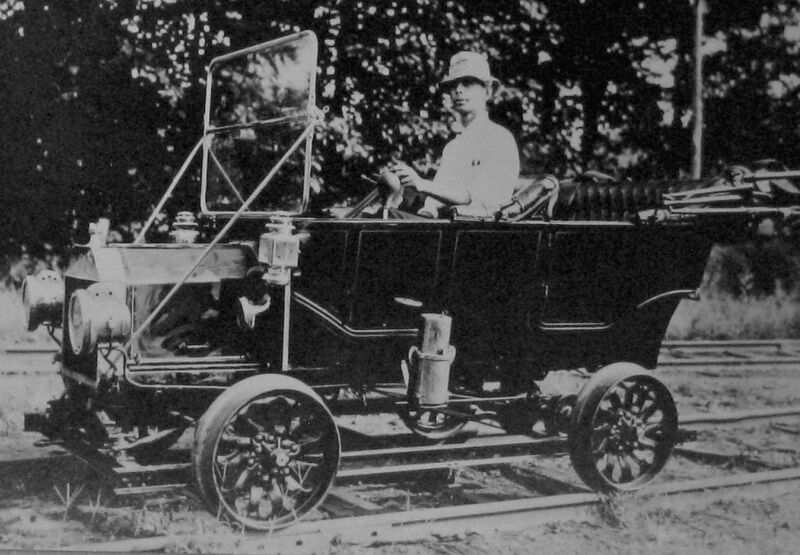 The wheels and rails must have got a pounding, even at the 20mph available with half-size wheels. Why would they do that? 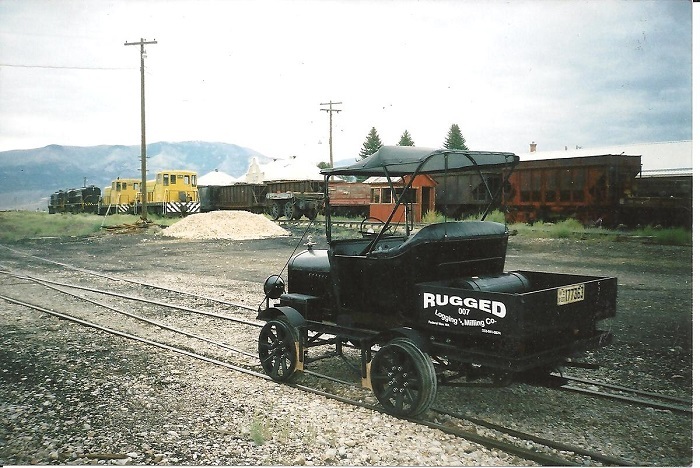 No railway (railroad) has curves so tight that the wheelbase of a T is too long. 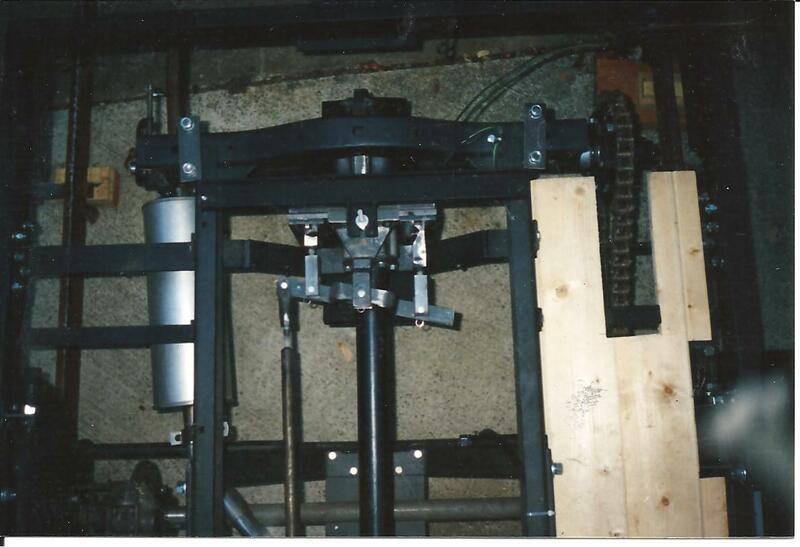 Or were there more springs between the underframe and the axles? Even if there were, I still ask 'why?'. I also see that the front radius rod is connected. 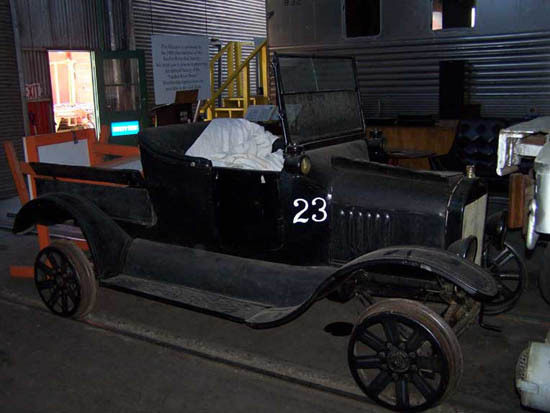 If the rear axle is bolted to the underframe, they had a mechanism that would induce huge strains if the car moved up or down relative to the underframe. 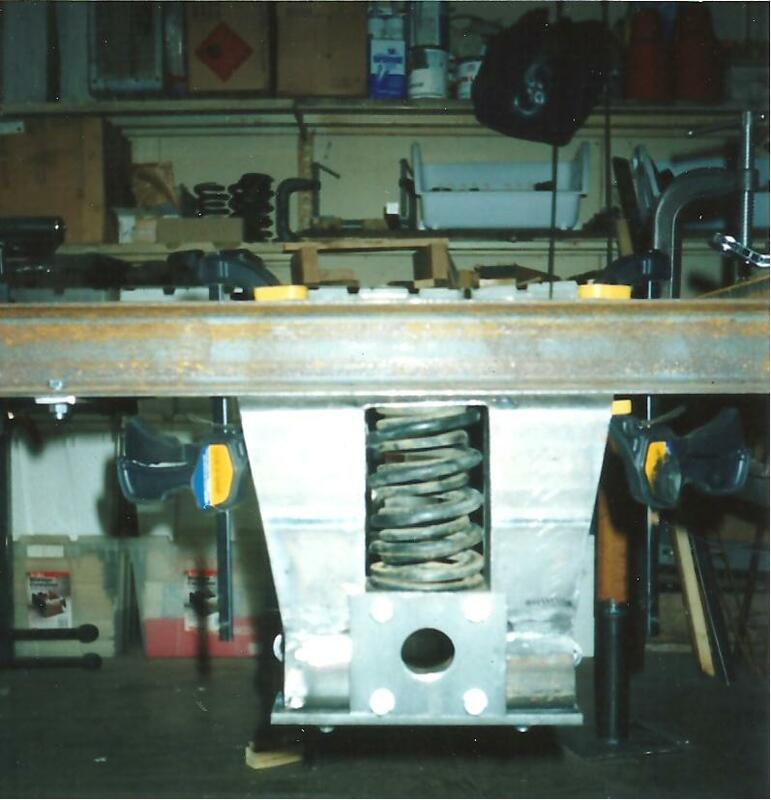 The rear radius rods would try to move the frame back if the car dropped, but the front rods would be resisting or pushing forward. 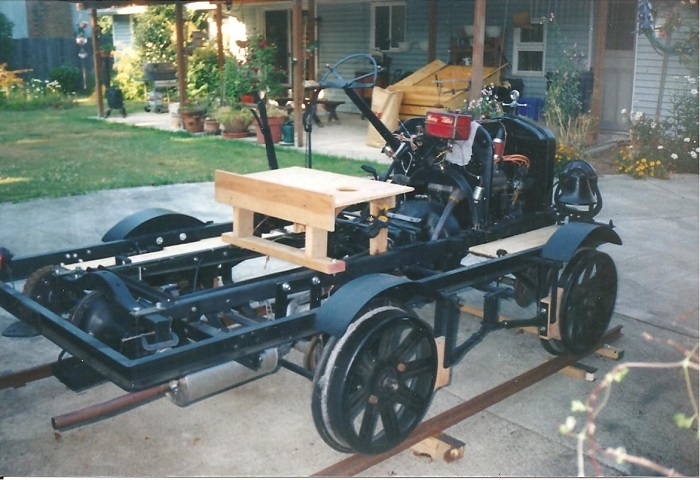 Having studied Bob's photos of his vehicle, I realise that the very different railcar shown in Jay's photo also has chain drive, and its gearing probably compensated for the smaller wheels. Bob's design is ingenious - especially the '2-speed' axle (forward and reverse). I think I see a disc brake hiding in there too. And he has a wheel (well, half a wheel) to hang onto! OH! 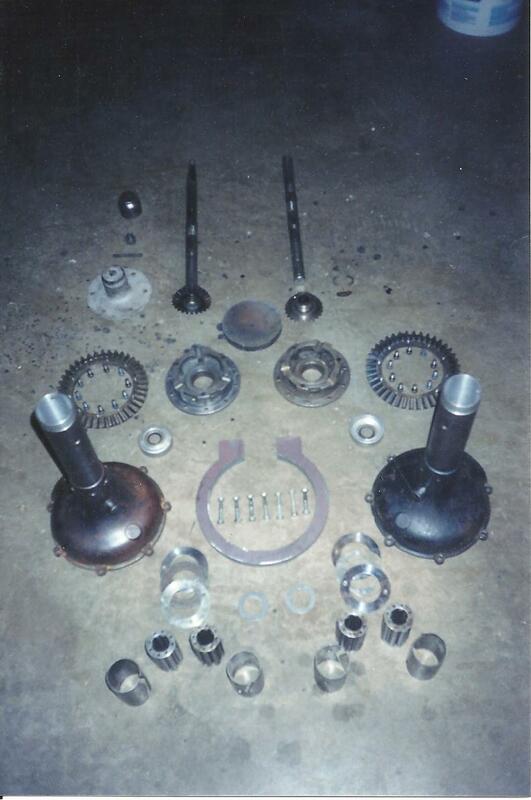 I thought Bob's car exploded...It started out in the pictures as a whole car and as they progressed it ended up in pieces! I'm just funnen with you.